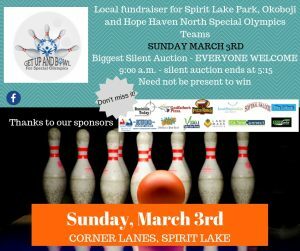 Come out and support our Special Olympics Athletes with our 8th Annual Get Up and Bowl for Special Olympics. Sunday, Feb 24th 9 – 6. 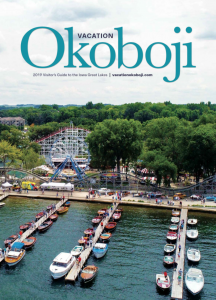 Pre register your team for bowling with registration form at exploreokoboji.com Silent auction 9:00 a.m. – 5:15 p.m. Hundreds of items for the silent auction. This fundraiser support our athletes with new equipment, uniforms, and travel expenses so that they can compete regionally and state wide for events including golf, track & field, bowling, basketball, bocce ball, cycling, cheer leading, and many more. Our teams strive to create healthy life long skills all while building confidence, communication and healthy competition.